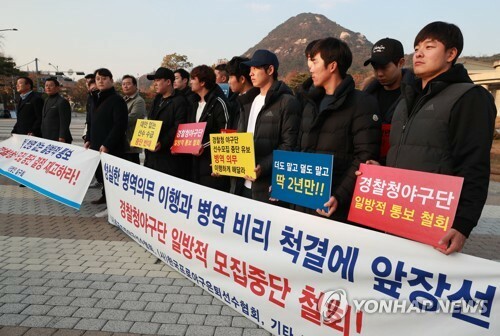 SEOUL, Nov. 14 (Yonhap) — South Korea’s baseball community on Wednesday staged a rally near the presidential office in Seoul to protest the abrupt halt to recruitment at a police baseball club. 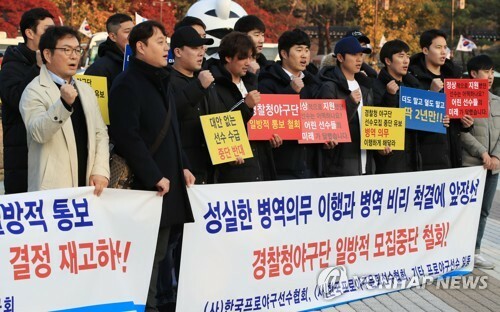 Members of the Korea Professional Baseball Players Association (KPBPA), the Korea Professional Baseball Alumni Association, a body of retired players, and the Ilgoo Club, made up of former and active coaches and managers, took to the streets near Cheong Wa Dae, asking the government to sustain the police baseball club until 2023. The Korean Police Baseball Team, which plays in the Futures League, the second tier of the Korea Baseball Organization (KBO), was founded in 2005 with the purpose of helping baseball players stay in the game while fulfilling their mandatory military duties. Players who join that team are part of the auxiliary police, completing their national duty as police officers after finishing basic military training. The South Korean government last year announced it will abolish the auxiliary police by 2023 and recruitment will end by 2022. But the National Police Agency decided to stop recruiting athletes immediately and disband its sports teams by next year. Those who participated in the rally said they respect the government’s decision to scrap the auxiliary police system by 2023, but they accuse the National Police Agency of making a decision to stop recruitment without consulting with the KBO. The representatives of the baseball groups later handed in a letter at Cheong Wa Dae asking for support on the police sports club issues. A similar request has been made by the football community, who denounced the police’s abrupt recruitment stoppage at Asan Mugunghwa FC, a second-division club run by the police. Some 300 football officials staged a rally near Cheong Wa Dae on Nov. 2. According to baseball officials, only 20 players will remain at the police baseball team for next season, making it almost impossible to run the team for a season.